SpyralSearch is the publisher of investigative tools on CD - geared specifically toward the needs of Adoption Search Specialists, Private Investigators, Genealogists and anyone else looking to identify or place a particular individual at a certain point in time. The parent company of SpyralSearch is Research Etc., Inc., located in Scottsdale, Arizona. Research Etc., Inc. is a family-owned, licensed Private Investigation Agency, and has been in business for twenty years. We specialize in pre-employment background screening for employers. We also handle Adoption Searches for adult adoptees and birthparents and have solved searches in almost all states. For more information on our private investigation services, please visit our website or call us. Research Etc., Inc. has amassed over 2,000 old city directories and telephone books in the last ten years, and the investigators have used them to help solve many cases. However, the more directories we acquired, the harder it was to access them, as we had to have them warehoused in remote storage and they were not on hand in our office. We decided several years ago to start scanning the books we used most onto CD, which was a long and time-consuming process. But several years ago, we hired an IT Computer Consultant who has upgraded all of our scanning equipment and computer software. and developed a time-effective process of putting our directories into digital format - with the added bonus of having them text-searchable. Credit is always given to the original publishers of the books, but the actual digital images on CD are copyrighted by Research Etc., Inc. and protected under the Digital Millennium Copyright Act of 1998. 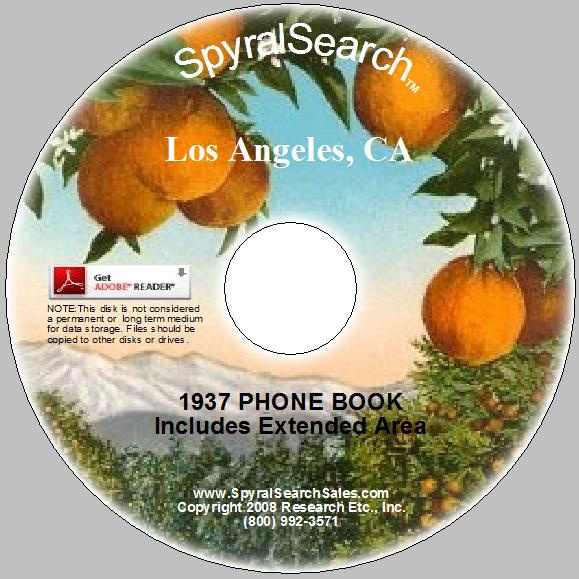 SpyralSearch archive CD's are only for the purchaser's personal use and not to be copied, distributed, or posted on a web site. Every disk is embedded with unique code that can be tracked back to the individual owner of that CD. We are still in the process of converting our entire collection of books into CD's, but feel we now have enough to make them available to other searchers.